Silicone is the ideal material for extreme temperatures because it withstands high and low temperatures far better due to its ability to be used continuously at 150°C (302° F) with virtually no change in its properties. Silicone is considered part of the rubber family and can be used to make malleable rubber-like items, hard resins, and spreadable fluids. It is considered “FDA approved as a food-safe substance” and is generally considered inert. Silicone bakeware is tolerant of both heat and cold, and can be used in the oven at temperatures up to 428 degrees Fahrenheit. It can go directly from the oven to the freezer, is microwave safe, and easy to clean. Silicone rubber is a silicon polymer with rubberized qualities. All silicone is inert, it does not react with other elements or compounds. There are no known health hazards of silicone. Silicone is not biodegradable, but it can be recycled easily – where facilities exist. Used widely in advanced countries for over decades now slowly India is gearing up to daily used silicone items like silicone ball shape ice moulds, silicone shot glass mould, silicone glasses, silicone coasters, universal silicone cork stoppers, silicone universal bottle grippers etc. Ice moulds and coasters are Ideal for private bars to differentiate the drinking experience with friends and can be used as promotional tools by liquor brands. Further silicone glasses will be cleaner and better for use at clubs where breakage and hygiene factors are of paramount importance. Branding can be done on the colourful cork stoppers and bottle grippers to avail the brand recall mileage at low cost. Silicone household utility items to name a few are anti slip dining mats, ironing mats, pot mats, silicone non-stick belan, silicone scrubbing sponge and garlic peelers. If you start using these products once then you will never settle for anything else is a guarantee. Silicone moulds for chocolates are available in various shapes like Eiffel tower, Taj mahal, camel, square, round and oval shapes. One major advantage of silicone bakeware is that it is considered more non-stick than many traditional types of bakeware, especially with muffin cups, chocolates and bread pans. 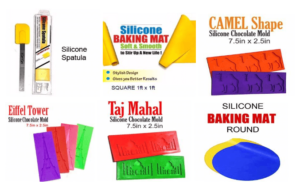 Silicone bake mats and other silicone baking products are often easy to clean and prevent sticking when baking. The flexibility of silicone bakeware and moulds makes it easy to get things out of them and makes clean-up easier. Silicone is also dishwasher safe, petroleum free and is not supposed to fade or scratch. Silicone fun time items as anti-slip travel series includes snake & ladders in games, colourful frisbee in sports, swimming caps and playing tokens. The series is becoming bigger with each passing month. Silicone health and wellness series boasts of items like bra strap cushions, silicone insoles and for freedom revolutionary standing urinal device for females. To stir up a new life pee anywhere anytime, no more forced to use dirty toilets, discreet, spill resistant & reusable, flexible 100% silicone best device while travelling. Please feel free to contact us for customised solutions in silicone range of products with features such as microwave safe, 100% food grade, high heat resistance, non-stick, anti-slip, easy dish wash etc.